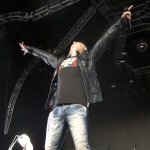 Def Leppard and KISS continued the Summer Tour 2014 last night in Auburn, WA with another unchanged 14 song set played. Joe wore his Booty Ruben style hat again as the band played another 75 minute set at the White River Amphitheatre suggesting a mostly unchanged set for the 2014 tour (until they get to Mexico). The show started with the live snippet of 'Won't Get Fooled Again'. Joe wore a Seattle Seahawks American Football scarf during the end of the show (as shown below). The team having won the Super Bowl in February. As with the previous venue in Ridgefield the White River Amphitheatre has a massive roof covering most of the seated seated front section making the screens more effective with the early 8pm start time. KISS played the same set except a snippet of 'Won't Get Fooled Again' added on to (your Mother's favourite song) 'Lick It Up'. The next show takes place on 2nd July in Concord, CA.